We all have our favourite writers. Whether they’re a copywriter, novelist, poet or playwright, they have the power to make us feel emotions that run-of-the-mill writers can’t. They can put our imaginations in any place or time in history or the future, feeling a whole range of things. But the words they weave to entrance us can take minutes, or even hours to unfold. A good image, whether it’s a photo, painting, or a view, can stop you in your tracks. Instantly. It can make your heart skip a beat in a fraction of a second, and make you catch your breath. Of course, I’m being a bit poetic about the power of images here - it’s not often that these kind of reactions happen in a business context. It’s rare that an image makes you stop and stare. But they do elicit an emotional response, and that’s why we use images so strongly in advertising. You have only a second to capture someone’s attention and imagination, and a billboard or magazine page full of text isn’t going to immediately do that. If that was the case, advertising wouldn’t be an industry built on imagery. Let’s try a tiny test. Without worrying too much about the actual words and content, take just three seconds to look at the two emails below. Which one grabs your attention the most? It’s the one with the photo in it, right? 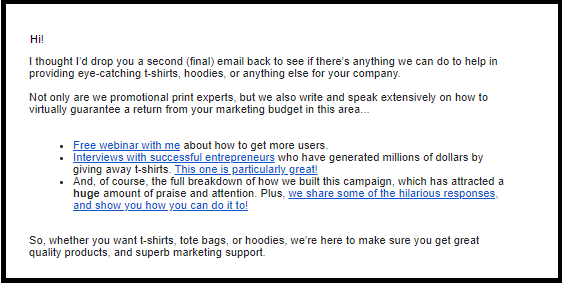 We found this out in dramatic fashion when we sent a sales email to 50,000 companies, each featuring a unique image of me, the CEO of RampTshirts.com, wearing their company t-shirt. We sell custom merchandise to teams, companies and events, so we wanted them to see what their very own t-shirt could look like. As in the above example, every single email had a personalised image in it. Not only did we take advantage of the benefits of using imagery in an email, but we also used personalised images. The reactions we received were incredible. Massive open rates and click through rates, literally hundreds of emails telling me it was the best and most eye-catching sales they’d email they’d seen, and a huge bunch of revenue. It should come as no surprise that images increase user engagement in articles and emails. But some studies cite that this could be by as much as a massive 94%. By now I should have convinced you that you should be considering using images in your emails. Especially if you’re selling a physical product. People love to see what they’re buying. But it can be just as powerful if you’re selling a service, too. Show customers before and after using your service. Or show a graph of their revenue increasing after using your service. Or maybe just how something that will capture their imagination and demonstrate the experience or benefit of your service. As long as you grab their attention, and make them read your email, you’ve done a big portion of the work. Most sales emails never even get read to the end. Just make sure your image is eye-catching enough to make them continue reading, small enough that it loads quickly, and that you test your campaign with different images to see what works best. 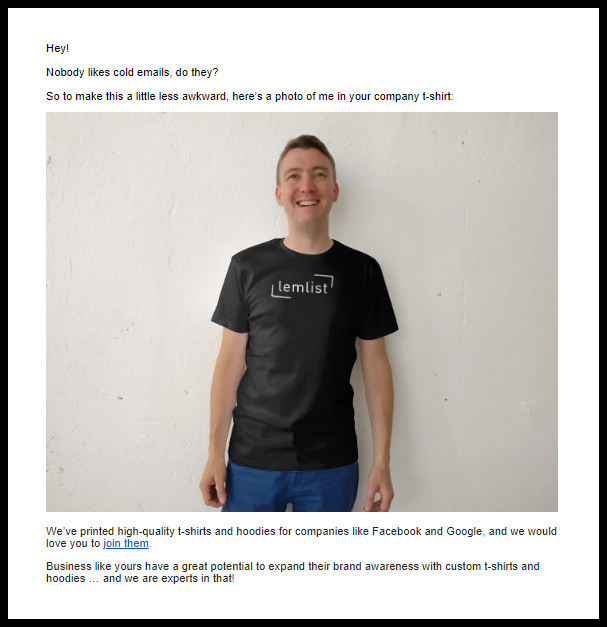 Until lemlist came along, it wasn’t easy to add a personalised image to their emails like we did - but we found a pretty solid way of testing our theory by spending 4 hours and $50 on it before committing more time and resources to it. I’m not going into the details of how we did that, but if you’d like to find out more about it, and the incredible responses to this campaign, you can check out our blog here. I just wish we’d had lemlist available to us at the time to make it easier!